Work of the Poet: Remember the old Hollywood Squares? 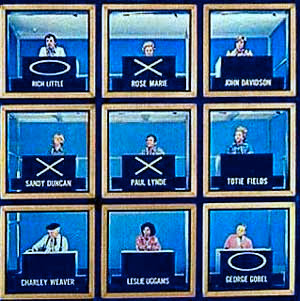 Remember the old Hollywood Squares? Q.If you're going to make a parachute jump, at least how high should you be? Q.You've been having trouble going to sleep. Are you probably a man or a woman? Q.Charley, you've just decided to grow strawberries. Are you going to get any during the first year? Q.Back in the old days, when Great Grandpa put horseradish on his head, what was he trying to do ? Thanks for the laughs...I mean the guffaws, I am cracking up here, out loud, with memories of the good ol' days, Friday nights at home with the family watching Hollywood Squares, what a show! I can actually hear them in my minds eye...am I telling my age??? That's some really funny stuff. Those are great! Paul Lynde was my favorite for his one-liners. Thanks for bringing back the memories. Those are great...and I do remember watching it back then. Who could forget? Awesome show! These are so funny! I got some belly laughs just now. Those are hilarious! I remember this show and all of those names. The voice inflections kept coming to me while I read each response. I didn't understand some of the innuendo in those days, but I did get a lot of the snarkiness.